At full capacity, GMA 345 will support dual comm, dual nav and multiple aux receivers — totaling up to 7 radios. There’s a 6-place automatic VOX intercom with 3 modes of isolation. And a split-comm mode lets the pilot and copilot broadcast on independent frequencies. For example, the pilot can use COMM 1 while the copilot uses COMM 2. Upgrading the audio experience in your cockpit is easy with GMA 345. It’s fully rack-and-pin compatible in dual-Comm installations with the Garmin GMA 340 as well as select third-party audio panels. So, it doesn’t take long for your installer to pull out the old and slide in the new. The audio panel’s built-in intercom and marker beacon help further reduce installation time for the system. And since it can operate on either 14 or 28 volts, there’s no need for any external voltage regulators or the wiring that goes with them. 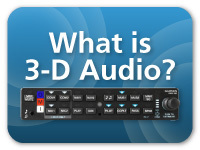 Fast, easy, affordable — that’s the GMA 345 audio upgrade path.